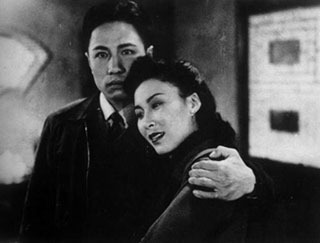 I’m very proud of the fact that I had watched Fei Mu’s 1948 masterpiece Spring in a Small Town (小城之春) in cinema. I can’t help keeping telling my friends at every opportunity that how I watched it with excitement, how I love this film and how I fell for the leading actress instantly. My friends probably have been tired of my bragging, half of them having no faintest idea what I talked about. I approached Fei Ming Yi, the master’s daughter and one of the organisers of the retrospective, asking her where she got the copy. She said she borrowed it from Beijing Film Archive and, certainly used her influence to get the deal, had to ‘garantee the return on my life’. Afterwards, I always take it as a badget of honour as being in that cosy small theatre that evening.